The best of the Midwest has arrived in New York City. These two angels, Mia and Marina, moved to the city almost two years ago from Michigan to attend University. The two best friends were lucky enough to meet each other back home and embark on this journey together, both studying fashion at New York’s top fashion business schools. 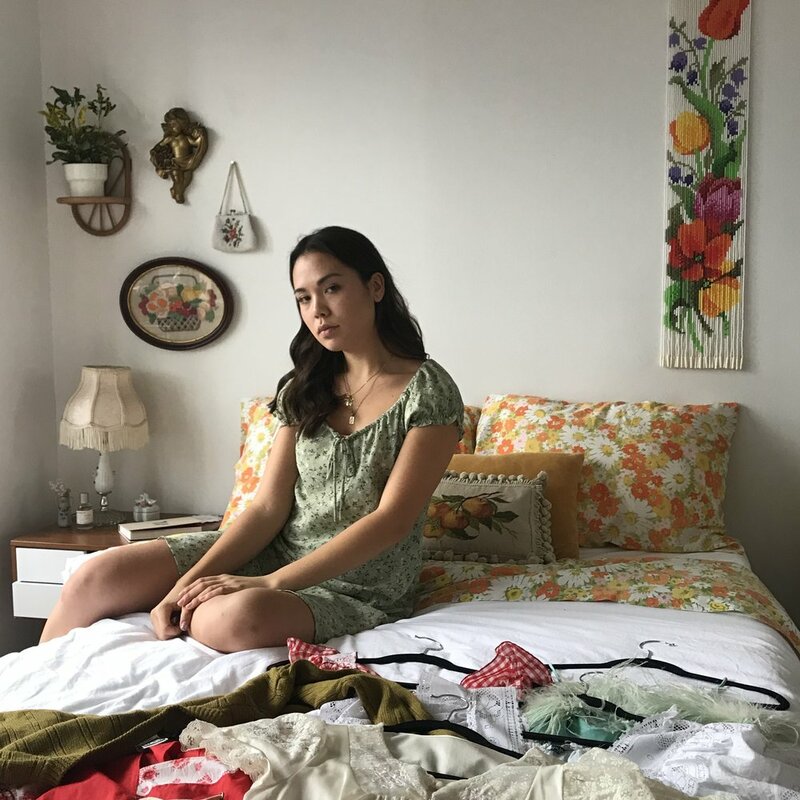 With impeccable style and an eye for interiors like no other, Mia and Marina moved in together this fall, creating a space that radiates warmth and light (and boasts mostly vintage pieces). Read on to get to know the duo and catch a glimpse of their beautiful home. Born: Dublin Ireland, but i’m also half Russian. I moved to Michigan when I was 8. Mia: I’m in this major called Strategic Design and Management at Parsons. Sounds fancy but it’s really just learning about the design of business and marketing. Marina: I’m studying advertising and marketing communications at FIT. Mia: It’s funny because Parsons was never my first choice until the last minute, I had my mind set on another school for most of High School. But after reading more about the major i’m in I realized how unique of a learning experience going to parsons would be over any other school. I love how even though I’m in business classes, professors encourage creativity in everything we do. It’s a nice balance. Marina: Most of my classes are in the morning so I wake up pretty early. I make breakfast, go to class, and after class I do some homework/studying. Twice a week I intern for a stylist, Danielle Nachmani. At night I like to workout, usually run or do yoga. And Mia, my lovely roommate, is a really good cook so she always makes an AMAZING dinner. I clean the dishes haha. Why did you pick said school? Mia: I’m in school a lot less than I was last year, only 2 days a week this semester. It’s been really nice and I feel a lot more independent. I am a true creature of habit, so my mini school weeks typically consist of studying, working out and cooking! I love cooking during the week, I don’t get to do it as much when i’m working or hanging out with friends on the weekend. Marina: I picked FIT because it has great learning/career opportunities. Although it’s a fashion school, the marketing and communications major is pretty broad, and what I’ve learned so far can be applied to other industries besides fashion which is great. I wanted to be immersed in an environment where everyone has similar interests and is striving toward their goals. I also didn’t want to go to a traditional college with a campus and greek life. FIT seemed like the perfect fit because it was in the heart of NYC and offered what I am interested in. What was the adjustment like from growing up in the midwest to living in NYC? Mia: It was a huge learning and growing experience for me. Especially coming from a tiny all girls high school, the transition to a huge city was intense. Even though I was desperately ready to leave my small hometown in Michigan, transitioning was still a hard process. But eventually things became easier. I found comfort in having some family in the city and having Marina so close by made the city feel less huge. We had a super close knit group of friends in High School, so having a piece of that here made me feel at home. New York is a place I had to slowly fall in love with but once I did, I fell hard, and now I couldn’t picture myself anywhere else. Marina: Everything in the Midwest is so spread out, and you depend on a car to get anywhere. So, it’s nice having everything in close proximity. But it was hard the first year to get used to how loud and busy the city is. The Midwest is really quiet, and you could walk outside without seeing a single person. It was definitely a culture shock, and it got overwhelming at times to adjust to school and the fast pace of the city. Mia: Well to keep it general I for sure see myself staying in New York. And despite whatever it is I end up doing as a job, I just want to love it. I’ve talked to too many employed people who talk about their job like it’s a chore and my biggest goal for the future is to feel the opposite. So, I hope to be doing something that will allow me to practice my creativity and grow as person, whatever it may be. Marina: Whether I’m working or continuing with school, I definitely still see myself in NYC. I would love to work in fashion or media, but I am also interested in sociology and political science and am thinking about going into that eventually. Maybe not in five years, but at some point in the future, I would love to open my own vintage shop with pieces from the 60s and 70s. Mia: I’m constantly inspired by everything around me in this city, whether it be the charming architecture of the East and West Village, or the stylish grandmas that walk around beaming with confidence. These are the simple things that make New York a constant source of inspiration for me. But NYC aside, I’m constantly looking at 70s magazines for inspo. We all know the clothes were amazing, but I also find a lot of inspiration in browsing through photos of the home interiors with all the warm colors and abstract shapes, it’s almost impossible not to be inspired. Marina: Being in New York because I am surrounded by people that are true to themselves and their style. After moving to the city, my style has definitely developed, and I have gotten more comfortable expressing myself. I also think the people you surround yourself with is important. My friends are always inspiring me. You both have an eye for impeccable style and interiors, what does the connection between personal style and fashion mean to you? Mia: Thanks so much! They’re entirely interconnected for me. I care just as much about what cute thrifted knicknacks I have sitting on my side table as I do about the clothes I choose to put on everyday. I think personal style transcends into every aspect of my life. I love being able to dress and decorate my space in a way that reflects my personal style, it’s really fun for me. Marina: I think personal style and fashion are connected because they are always evolving. My personal style is always changing, and it reflects whatever is going on in my life in that moment. 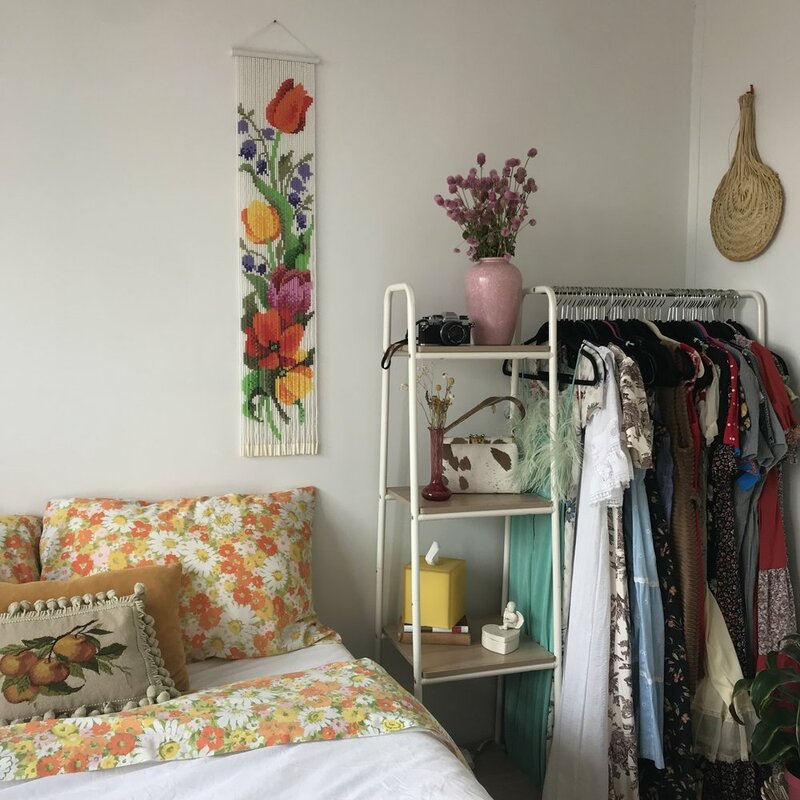 Since I thrift and shop mostly vintage for my clothes, I started doing the same for home goods, decorations and furniture. What I wear is reflected in the way I decorate my home and vice versa. They radiate off each other, and that’s also what keeps me inspired. Mia: I have a couple 70s prairie style day dresses in my closet that are really special to me. One of them is white and lacy and allows me to live out my little house on the prairie dreams and the other is a red gingham ruffled dress that makes me feel like a doll. They were both gifted to me by my boss from this past summer who runs a small vintage shop in Michigan. She taught me so much and because of that I treasure these pieces so much. Marina: This Capaf woven wicker bag that I found in a vintage shop in Dallas last winter. It was my go to bag this spring and summer. Mia: I started getting into thrifting Sophomore year of high school when I realized how much more clothes I could buy for so much less money. Eventually my love of thrifting to literally be thrifty turned into a style evolution for me, I slowly stopped shopping at the mall and was way more interested in experimenting with thrifted and vintage pieces. Now 99% of my clothes are second hand and what’s made me fall in love with it is not only how much cheaper and more sustainable it is, but that every piece has its own life behind it that you can reinvent with your own personal style. Marina: I got into collecting vintage about two years ago. Mia and I would go thrifting together in high school. After moving to New York, I was exposed to more vintage, and I became more open and comfortable wearing unique vintage pieces. Being here allowed me to experiment with my style. My mindset on shopping for clothes completely changed. Thrifting has allowed me to develop my own sense of style instead of picking out what fast fashion and trendy stores had laid out. Now, thrifting and going to vintage shops is therapeutic for me even if I don’t buy anything. Mia: Don’t take anything too personally. Nothing other people do actually has to do with you. If you always let what other people say and think affect you, then you set yourself up for needless pain. Focus on loving yourself because you are your harshest critic. Marina: Don’t compare yourselves to others. Everyone moves through life at their own pace. Mia: Peacefood cafe has these vegan chicken tenders and chocolate cake that i’d die for, but Avant Garden is the hands down the greatest restaurant in the city in my opinion. I always recommend it to visitors! Mia: Farmers markets! I’m constantly inspired by color so paying a weekly visit to the market and seeing all the beautiful colors of fresh produce and flowers give me life! I also love to cook so it gets me inspired to cook as well. Marina: Coffee shops. Even if I am just reading a book, I like being around people and being reminded that everyone here is working towards something whether it’s school or their career. Mia: I usually make my own drip coffee and I buy the cheap grounds from trader joe’s! But since it’s right next to school I usually pay a weekly visit to Joe, I really like their coffee. Mia: Either Central Park or Elizabeth Street Garden. I love being surrounded by nature, it reminds me of home. Mia: Since I’ve been living and going to school here for two years now I feel inclined to say East Village. It feels like home! But I’m in Soho/Chinatown a lot for my internship and I always enjoy walking around/exploring those areas! Marina: The West Village. It’s so quaint there I love it. Mia: I take the NQRW most of the time because of work, so taking those trains is second nature at this point. But it’s not my favorite... I guess I don’t really have a favorite train line. Marina: R/W. I take it every day to get to school. Mia: Everyone here is on their own mission, that’s what makes the city feel so fast paced I think. Even though it can be a lot when I’m not feeling motivated, seeing everyone else hustling for themselves is incredibly inspiring. It makes you realize why everyone wants to be here. I’m so grateful to live in this beautiful place. Marina: Being around so many unique people. And having the freedom to express your true style.